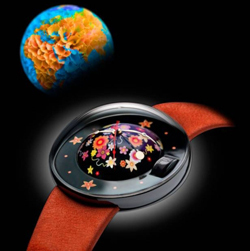 The Swiss company Magellan has announced the release of women’s wristwatch in 1521 Flowers, in which the traditional art of watchmaking is combined with innovative production technologies, radically different from the accepted industry standards. Magellan lineups are unique in terms of both time mechanics, and appearance. The design of the new watch kept all the key elements of the collection “1521” – the hemispherical dial, curved arrows, central, convex sapphire crystal. Novelty is presented in stainless steel with black PVD / CVD-coated. In the hemispherical dial manually applied floral composition. Work on each face lasts 80 hours. Hours 1521 Flowers are designed based on the automatic mechanism with the function of indicating hours, minutes, seconds (by using the central curved arrows). The model comes in a bright orange strap nubukovom in harmony with colorful floral images of the dial.